Two speed, 115V, 1 phase, ball bearing, totally enclosed and permanently lubricated Industrial Duty Circulator Fan. Pull chain switch with a 12 foot long cord and an SJT type 3 conductor. Meets OSHA standards and is ETL C/US listed. 1/4 HP electric motor. Two speed, 115V, 1 phase, ball bearing, totally enclosed, and permanently lubricated Industrial Duty Circulator Fan. Pull chain switch with a 12 foot long SJT type 3 conductor cord. Meets OSHA standards and is ETL C/US listed. 1/3 HP electric motor. The two speed, 115V, 1 phase, ball bearing, Portable Blower has a totally enclosed motor. 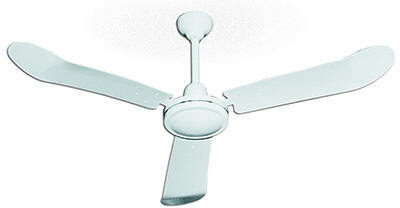 The fan also features 3 paddle style steel blades and 8" rubber wheels. It has a rocker switch with a 15' SJT type 3 conductor power cord. Meets OSHA standards. ETL C/US listed. Three speed, 120V, 1 phase, totally enclosed, permanently lubricated motor Work Station Fan. Mount with one bolt or lag screw to walls, ceilings, work benches, machines or any surface. Pull chain switch on a 10 foot long SJT type 3 conductor cord. Meets OSHA standards and is ETL C/US listed. The three (3) speed, ball bearing, Portable Work Station Fan is totally enclosed and permanently lubricated. This fan has a rotary switch, 360° tilting head, 10 foot long SJT type 2 conductor cord, and coated steel guard. Steel hub/spider aluminum paddle blades and meets OSHA standards. Overall size is 25"W x 27"L x 53"H. ETL C/US listed. Two speed, 115V, 1 phase, ball bearing Commercial Circulator Fan. Pull chain switch with a 9 foot long cord and an SJT type 3 conductor. Meets OSHA standards and is UL listed. 1/4 HP electric motor. These Circulator Fans do not have a totally enclosed motor. They should be used in a clean and dry commercial application. The two speed, ball bearing Commercial Circulator Fan is pull chain. Meets OSHA standards and is UL C/US listed. This fan does not have a totally enclosed motor and should be used in a clean and dry commercial application. Features 8 foot long SJT type 3 conductor cord and 8" rubber wheels. Two speed, 1/3 HP, 115V, 1 phase, ball bearing motor, permanently lubricated. Rocker switch (MB-C-30) or rotary switch (MB-RS-C-36) standard. 6 foot long SJT type 3 conductor cord. Meets OSHA standards and is UL listed. These Direct Drive Blowers do not have a totally enclosed motor.They should be used in a clean and dry commercial application. Three speed, 115V, 1 phase, permanently lubricated motor, with rotary switch and 7 foot long SJT type 3 conductor cord. Meets OSHA standards and is UL listed. These floor fans do not have a totally enclosed motor. They should be used in a clean and dry commercial application.